What a crazy 2011 deer season I had. It started in early November, bow hunting in our Kansas hideaway. 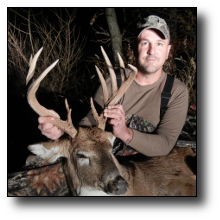 Thirty-six hours into our trip, I had a big 157 inch, heavy framed deer, with four stickers, on the ground. After "hunting" the next day, without a bow and only a camera, I was sitting in a stand the following day, in the rain, in the cold, decided to head to Nebraska. I knew of a few HSP farms within a couple hours drive, and although I didn't want to leave my hunting buddies, I didn't want to hunt the rest of the week for only a doe or two. So late morning, I climbed down, called HSP, got reservations for that evening and the next day, and about 1130 AM, I took off, telling my friends "I'll be home late tomorrow night." The last place I stopped before arriving at the farm was a small hotel, where I made a reservation for the night. I then get to the farm around 230 pm, quickly load my lock on and bow on my back, and head for a crash course scout of the land. I find a large cedar tree in a big cedar thicket draw, with a good trail coming by it. The trail would be my one and only shooting lane, and I had no visibility, basically, outside of my shooting lane. Not my ideal set up, but all I could come up with with the amount of time I had for the day. I start cutting, and 15 minutes or so later, my lock on is in place and I'm reaching around the tree to secure my safety harness. I hear noise behind me, look at the trail, and there is a huge doe with a spike buck behind her. "Wow." The land looked good, but I was now more optimistic than I was earlier. It was now a little after 3 pm, and at 5 o'clock, I had a nice buck walk through my lane. By the time I grunted at him to stop him, his vitals were behind a small cedar bush. He was very close to it, and I felt good about the shot, so I let an arrow go. 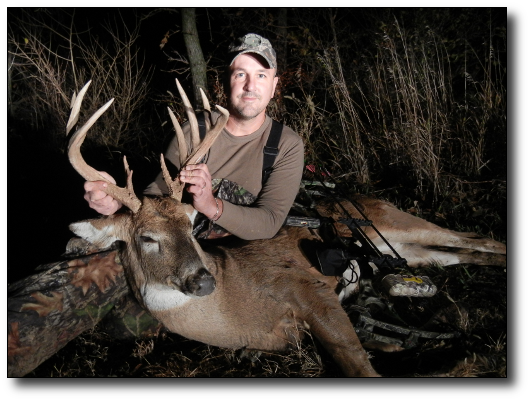 Thirty minutes later, (somehow), I had a nice, mid 130 pound buck loaded up and was headed back to Kansas. No need for the hotel. The next day, I'm sitting in a stand back in Kansas, and I see a large buck trailing a doe. They disappear into a woodlot about 100yards away. I figure "what the heck," I rattle at him, and to my surprise, he appears on the edge of the field, looking right at me. He then takes off at a full trot directly at me. Knowing I could not shoot this deer, I sit down, grab my camera, and quietly film this buck come within 15 yards of me, stops in a shooting lane and looks around. He then takes off for the doe. Filming a nice buck like this was actually a goal of mine this year. This deer was a beautiful, symmetrical 10 pointer. I'm guessing he would score in 160's. Others have said mid 150's, but whatever the score, it was a great experience and one I can share forever with friends and family. I did fill my doe tag a day or two later, and shared several great hunts with my buddies as they filled their tags. Three weeks later, I talk my wife into making a trip to NW Missouri with me. She doesn't hunt, and it was actually her idea to "tag along". How grateful I would be a few days later that she was with me. Again, I'm going to a piece of HSP land I've never been on, but rifle season has been over for almost two weeks and the land has had no activity on it since then. I felt good about my odds of seeing deer. I sat on the edge of a thicket abutting a cut cornfield the first morning to "just observe" what the deer do and where they move. My plan quickly goes from "observing" to "how do I kill this monster buck" while on the ground. As soon as I can see across the field the sun comes up. I can see a huge, mature buck trailing a doe across this field, and they're headed RIGHT at me. I can now see that I'm standing on the side of a trail that the deer use to leave the field and head into the thicket. I say to myself "This is NUTS!" I quickly slip to the backside of the tree and somehow end up with a pretty good ambush spot. It's been raining for several days, and everything is quiet. The deer get to withing 40yards, and the doe turns and heads into the thicket just up from me, buck trailing. I see exactly where they go in, and after the sun gets high, I get a stand hung right there. "Wow...that was very close though." To make a long story shorter, I moved my stand twice to get on that deer. I saw him three out of four hunts and never disturbed him. As I was moving my stand the second time, I slipped off a climbing stick as I was coming down, and fell a short distance, and "messed something bad up in my knee." I knew my season was over right then and there! But what a wild one it had been. This is where I was very grateful that my wife had tagged along, as she was able to drive the 15 hours to get back home. I just had surgery to repair a fractured tibia and torn ACL. Not the way I wanted my season to end, but grateful it was only a leg. Thanks to HSP for the great opportunities you provide and the memories you helped create for me in this wacky, crazy, 2011 season.